Featured catalogues for the baby products. All stores here provide baby products and some of their online catalogues are focused on baby products. You can view all products of Baby Catalogues Australia here. Target baby products are similar to Kmart Baby and Big W Baby products and they also offer nursery items and safety products like booster seats. Also Myer baby clothing, essential items for daily care, baby products for good prices are featured on the Myer and other store catalogues. Online baby catalogues are always found on this page. 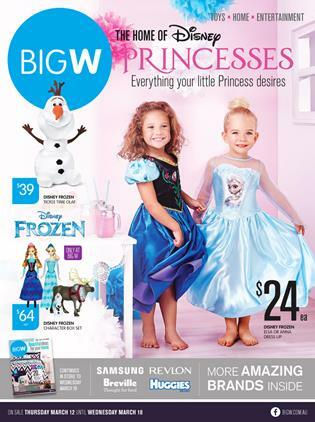 Big W Catalogue April Holiday is created with regard of toys, entertainment products and clothing offers mainly. These are main focuses of the catalogue but it also contains household needs, baby care and baby clothing, nursery products, books, electronics like Apple iPad, bedroom products, cookware and kitchen ware offers. In another saying Big W catalogue is mixture of great products and gifts in April for everyone. You will be amazed if you are looking for high quality products like these appearing on latest Big W Catalogue. Big W Clothing offers are consisting of casual products, sports products, shoes for kids. And baby products are featured on latter pages. Visit pg; 1-7 for kids' clothing products of Big W Catalogue April Holiday. Toys are also separetely given among these clothing products. Sleepwear including slippers for children on pg; 2. Emerson casual products for kids on pg; 3. Avengers costumes on pg; 3. Casual products and "only at Big W" offers on pg; 4-5. Emerson Junior casual and cozy kids' wear on pg; 6&7. (Especially for Girls). Shoes for kids on pg; 8. See new books of Big W for kids on pg; 12&13. School supplies like backpack with Avengers theme on it are available. 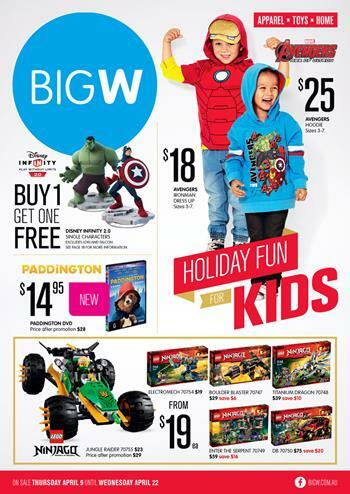 Avengers special products are new big deals of Big W this week. These prices are effective until 22 Apr. Toy sale of Big W starts on pg; 14. Visit these pages to check new low prices of Big W Toys. Don't miss out any of the new deals by the retailer. Check out scooters and similar sort of toys on pg; 14. Avengers toys on pg; 15. Fireman Sam and Octonauts toys on pg; 16. LEGO variety like Friends and Duplo Disney Princess are on pg; 17. Skylanders Trap Team and new release DVD movies on pg; 18-19. Electronic sale of Big W April Catalogue consists of Apple iPad and some HD LED TV offers. Viano's high technology HD LED TV and Philips products are on pg; 20&21. For more of the catalogues and toy sale please visit categories and tags. Big W Catalogue Toys March sale is a great shopping place with a nice readable catalogue range you can find in this post. It was published recently and you can find a huge product range to see new deals. Big W toy sales are similar to those of Kmart and Target. Target has the greatest toy catalogue in Australia but it is generally published in June or July. Also Kmart and Big W have got great toys. Actually Big W and Target have similar brands and toy types. Big W toys and toy prices are featured with full view. On this Big W catalogue you can also see electronics, clothing for kids, bikes, outdoor play products, baby care and nursery, food and beverage, music, dvd movies, computers and many more similar products. Latest Big W catalogue has a special feature. It has new product range of Disney Princess. Clothing items for children and special prices for toys are available with a great view of the Big W catalogue. Various Disney Frozen and Disney Princess products can be found on pg 2-3. Slipper is $10, briefs for girls are $11, leggings for kids are $9 only. Big W offers unique range of products on pg; 4-5. You can find them only at Big W stores. Lego Star Wares, TMNT t-shirts with prices of Big W are on pg, 6&7. Toy brands like Fisher-Price, Lalaloopsy, Paw Patrol, Crayola are featured. Don't forget to see new outdoor play products like swing set. Dunlop biking supplies and bikes are new sale. Toys, baby care products and nursery items are on pg; 12-13. Huggies dry nites is $15, and Mothers Choice convertible in-car seat is another sale. We can divide the review of this catalogue into three parts since it has got three individual sales. Please take a look at the preview page. Click the image to go to preview page. See full catalogue there. Baby catalogues page may give you more idea about this kind of products. Also don't forget to see home appliances catalogues. Top quality Big W baby Catalogue products are featured on the catalogue I linked with an image on this post. Nursery items of the Big W are preferred by most of the visitors who are already mothers. Besides for the fun of kids there is a really nice looking product range consisting of kids toys, educational toy products such as Mickey or Minnie plush potty (priced at $39). On pg;6&7 you can view these products. Safety is another important manner for the baby products. You can check the online baby product of Big W with clothing items such as Dymples products. Find out a range of products with clothing offers for babies. Deals for the products from Big W can make you shop at the stores. Beautiful online products of baby clothing can be found on this section. Karicare Plus and Heinz are leading brands of nutritional baby food products on pg; 5 of the latest Big W Catalogue. You can see new deals of the Big W Catalogue for the baby food varieties of these brands. * Heinz Formula, 2 for $26 for infants. Mainly focused on education there are entertainment products of Big W. On the pg; 7 you can see Bambino toilet trainer with a ladder attached on the front. Asssorted nursery toys are another deal of the Big W baby catalogue. Don't forget to learn new prices for wipes, baby love baby pants on pg; 6. Also there is a new school products range of the Big W on the latter pages.